Wollensak brand. Easy grip zoom collar. Nice flat field from edge to edge. Continuous adjustable focal length from 7.2mm thru 21.5mm. 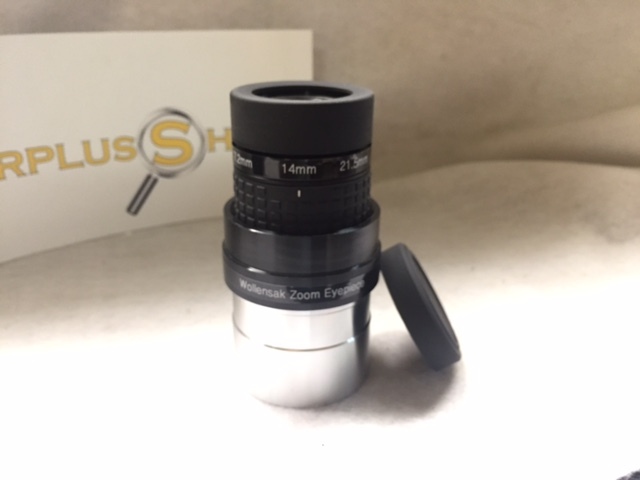 Fully multi-coated optics with 7 elements in 5 groups. Apparent field of view varies from about 40 degrees to 54 degrees. Eye guard has an up/down adjustment. Protective cap included. 2 inch barrel is blackened inside and threaded for filters. New. Limited supply.